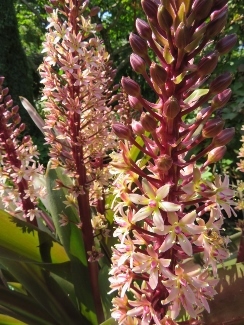 Joy Creek Photo Archive (c) all rights reserved Gardeners often ask for dramatic plants and Eucomis comosa 'Sparkling Burgundy' and other named cultivars are among the plants that we recommend. The broad strap leaves alone are an arresting sight as they transform from burgundy to green and back again in the course of the growing season. They turn burgundy again just as the amazing inflorescences begin to develop. Rising on 30-inch stems, the racemes are made up of pink, star-shaped flowers. The raceme is topped with a crown which makes it look like a pineapple and thus the common name pineapple lily came to be. The glossy strap leaves continue to look attractive into the fall, long after the flowers have given way to beadlike fruits. July, August. 3 ft. x 3 ft.